Singapore, 1 March 2011 – 65,000 general admission tickets for the 2011 FORMULA 1 SINGTEL SINGAPORE GRAND PRIX will be released for sale on 3 March 2011, 0900hrs (GMT+8). 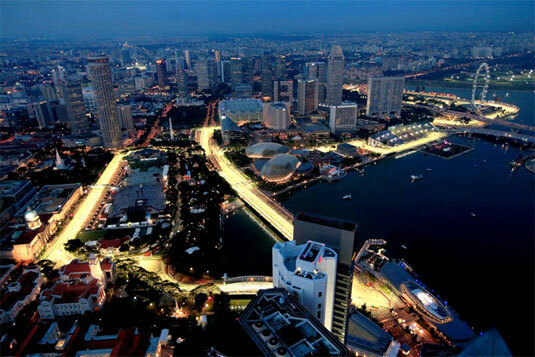 Race Promoter Singapore GP has introduced a number of new ticketing initiatives for the event, which will be held at the Marina Bay Street Circuit from 23 to 25 September. ”Building on the success of 2010’s sell-out, we have again reviewed all ticket prices to ensure they offer not only great value but also an unforgettable experience. In addition to our usual popular early bird ticket prices, we are delighted to offer race-goers a Group Booking Special so that patrons who buy in bulk can benefit from greater savings,” said Mr. Michael Roche, Executive Director, Singapore GP Pte Ltd. The tickets will be priced differently across two phases: Early Bird (3 March to 8 May) and Regular (9 May to race week). The early bird phase offers fans savings of up to 17% with the Republic, Esplanade Waterfront, Padang and Bay Grandstands offering the best deals. A new group booking scheme for the three largest grandstands – the Bay, Padang and Pit Grandstands – is being introduced for 2011. This is in response to feedback from fans who have requested for special packages for groups of family and friends. The Group Booking Special offers savings of up to 10% for fans who purchase four or more tickets in one booking. For greater savings, fans can put together a group of eight or more and enjoy up to 16% off. By combining the early-bird discounts with the Group Booking Special, fans can enjoy up to 30% off a regular priced individual ticket in selected grandstands. For example, fans who purchase eight Bay Grandstand tickets during the early bird phase will pay S$208 each, instead of S$298 at regular single ticket pricing. The Group Booking Special is applicable for the first 40% of the relevant grandstands' inventory and is available via the official Singapore GP website, ticketing hotline and all SISTIC outlets. The Stamford Grandstand has been lowered by S$200 in order to achieve optimal commonality of pricing amongst the grandstands in Zone 4. Spectators at the Stamford Grandstand enjoy close proximity to the main entertainment stage in the Padang. To further benefit patrons with limited mobility, an additional wheelchair accessible platform will be constructed at Zone 1 this year. As with previous years, single-day Zone 4 Walkabout tickets that offer access to the largest entertainment stage at the Padang as well as the Esplanade stages will be released at the onset of the regular phase on 9 May. Single-day Zone 4 wheelchair tickets will also be released during the regular phase. Multi award-winning band Linkin Park has been confirmed as the headlining act on race day, 25 September 2011 at the Padang main stage. Full details of the complete S$5 million entertainment line-up will be announced in the coming months. "We've had very positive feedback from our enhanced entertainment programme in 2010 and our announcement of Linkin Park is just the start of another stellar line-up of artistes for 2011. All tickets offer incredible value for money with world-class entertainment, all included in the price of the one ticket," added Mr. Roche. Tickets will be available for sale online (www.singaporegp.sg), via the ticketing hotline +65 6738 6738 as well as all SISTIC outlets from 3 March 2011, 0900hours (GMT +8 hours).